lakemichiganpainting, originally uploaded by ordinarymoment. Our last challenge while finishing our porch remodel this past summer was figuring out a way to cover the large, dirty, paint-peeling window looking into our garage on that long stretch of white siding. We didn’t want to spend hours sprucing up a window to nowhere, so we decided a big piece of art was needed to break up all that white space. 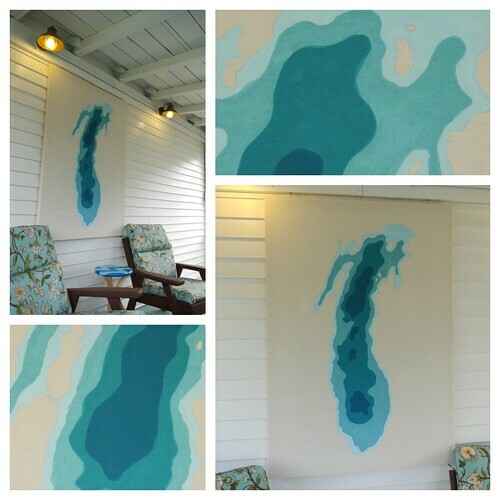 We went through a few ideas and settled on a huge depth painting of Lake Michigan, which is two blocks away from our house. Inspired by this etsy card by Crafterall on Pinterest, showing a papercut topography map of the lake, we went about beginning our giant masterpiece. M built a simple frame large enough to cover the window, then I helped him stretch some canvas we had over the frame. He used a projector to trace the outline and I chose monochromatic blues to paint a simplified version of the depths. We bought inexpensive paint samples from Lowe’s for the paint. After we let it dry it was hung over the window to hide the ugliness and bring a big pop of graphic color + design to our relaxation space. Tomorrow I will share another little project we did using the leftover paint.